Another race, another win for Alvaro Bautista. Caricasulo (64) just managed to get the better of his teammate in a last lap showdown. 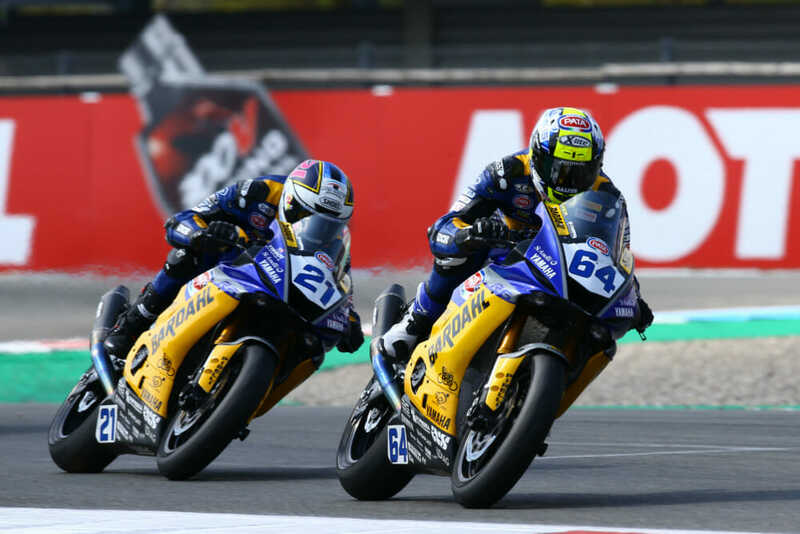 Federico Caricasulo (BARDAHL Evan Bros. WorldSSP Yamaha) passed his teammate Randy Krummenacher on the final tour to win the 18-lap Assen WorldSSP race, leading a close four rider Yamaha group across the line. Thomas Gradinger (Kallio Racing Yamaha) was third, for his first podium in WorldSSP. Jules Cluzel (GMT94 Yamaha) was in the leading mix then dropped back before working his pace back up to normal and passing the Kawasaki of Lucas Mahias (Kawasaki Puccetti Racing) to take fourth. Mahias set the fastest lap of the race twice, finishing fifth and just 1.277 seconds from the win, but being outgunned by the R6 riders at times. Corentin Perolari (GMT94 Yamaha) was sixth, winning a three rider battle that finally had Hikari Okubo (Kawasaki Puccetti Racing) and Isaac Vinales (Kallio Racing Yamaha) behind him. 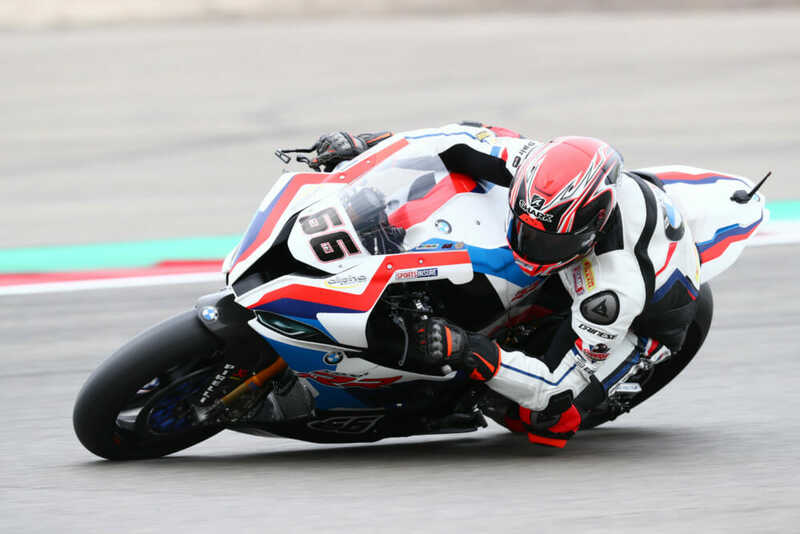 In ninth place Glenn van Straalen (EAB Racing Kawasaki) had his best race, with Jules Danilo (CIA Landlord Insurance Honda) similarly higher than his usual performances in 2019 so far. Raffaele De Rosa (MV Agusta Reparto Corse) was in podium contention until he fell with six laps left, in the final fast left of Ramshoek. In the championship, Krummenacher has 90 points, Caricasulo is now second with 73, Cluzel is third on 69 and Gradinger fourth on 40. Bautista made it a perfect 10 in race one at Assen. 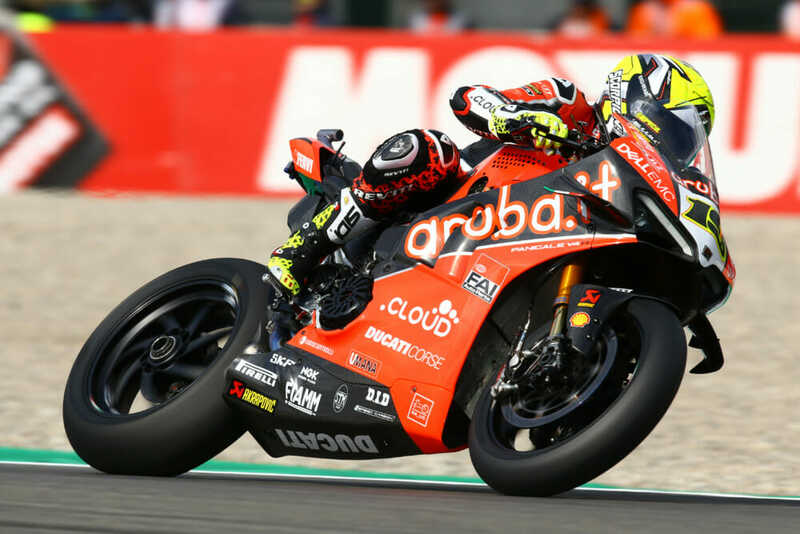 Alvaro Bautista (Aruba.it Racing – Ducati) had a stroke of fortune on Saturday to start from pole on Sunday but in Race 1 the diminutive Spanish star made great use of his grid spot and eased out to an eventually clear victory by 3.130 – his tenth race win in succession. Jonathan Rea (Kawasaki Racing Team), starting from eighth place, was fighting hard at his favorite circuit but was unable to get to the fleeing Ducati. He also had company at the end of the race, with Michael van der Mark (Pata Yamaha WorldSBK Team) a very popular third-place finisher in the cold winter sun at Assen. 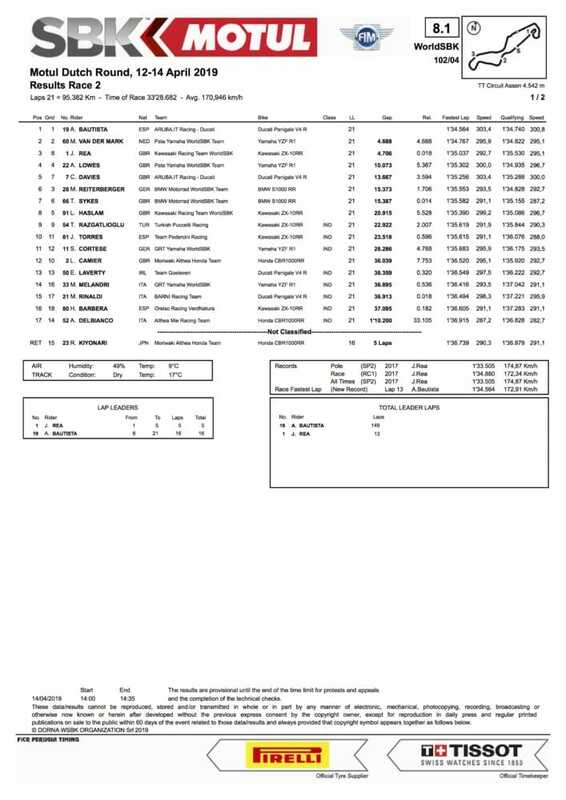 Alex Lowes (Pata Yamaha WorldSBK Team) and Leon Haslam (Kawasaki Racing Team) had a fight for the second half of the contest, with Lowes winning out in fourth place, Haslam fifth. Markus Reiterberger (BMW Motorrad WorldSBK Team) had a great ride, in second place of many of the early laps, but one-by one-the more regular podium challengers passed him as his lap times completely dropped off. He was sixth in the end; 15 seconds back after 21 laps. Chaz Davies (Aruba.it Racing – Ducati) was seventh on his own, while a three-rider fight for the last places in the top ten went to Jordi Torres (Team Pedercini Racing Kawasaki), if only narrowly, from Toprak Razgatlioglu (Turkish Puccetti Racing) and Tom Sykes (BMW Motorrad WorldSBK Team) tenth. Leon Camier (Moriwaki-Althea Honda Racing Team) was a stronger 11th, relative to some recent results. 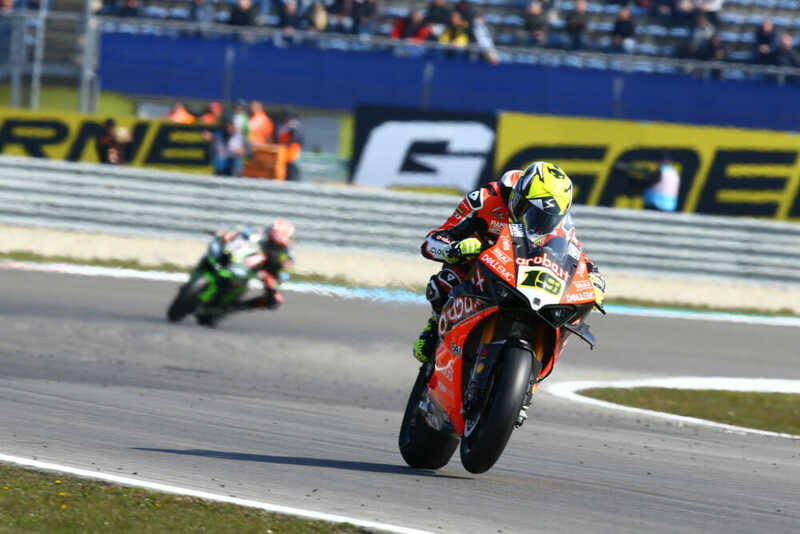 Bautista remains undefeated in Superpole in 2019. Track temperatures in Superpole rose to a giddy eight degrees as the riders opted for their qualifying rear tires, but a crash for Ryuichi Kiyonari’s Moriwaki Althea Honda at turn 13 brought out the red flags before most people could get their best attempt at a fastest lap completed. 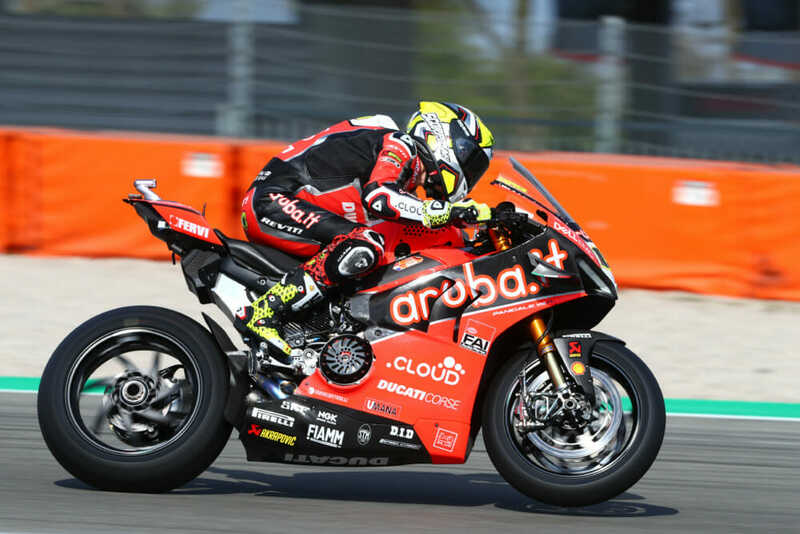 The new lord of the WorldSBK manor, Alvaro Bautista (Aruba.it Racing – Ducati), was thus the Superpole winner, by a small margin of 0.082 seconds over the local favorite Michael van der Mark (Pata Yamaha WorldSBK Team). 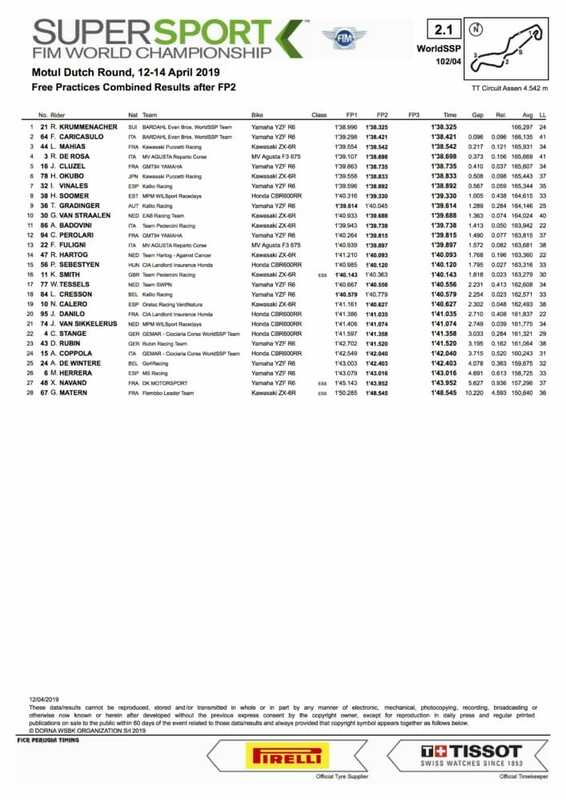 Third for the grid placings in Race One later today, and the Sunday morning Superpole race will be German hopeful Markus Reiterberger (BMW Motorrad WorldSBK Team), proving his and his new bike are more competitive every weekend. He was just 0.006 seconds behind VDM in Superpole. 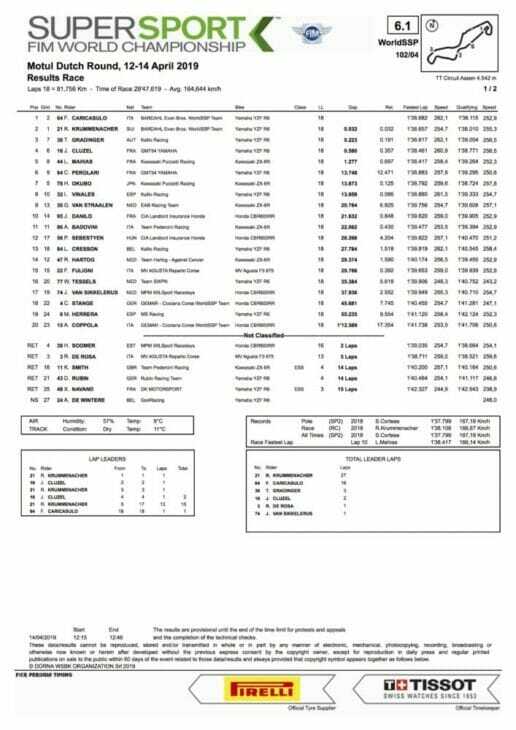 Alex Lowes (Pata Yamaha WorldSBK Team) was fourth, just 0.195 seconds from Bautista. 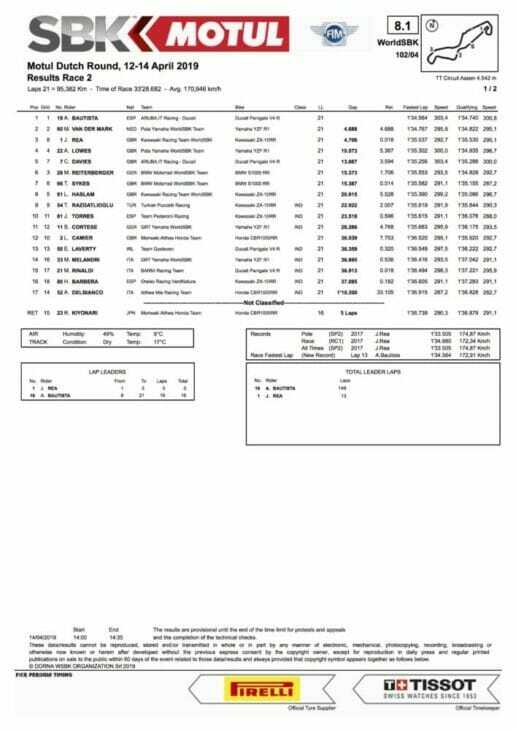 One of those riders to get caught out by the timings was Leon Haslam (Kawasaki Racing Team) in fifth place, and Friday fastest man, Tom Sykes (BMW Motorrad WorldSBK Team) sixth. Chaz Davies (Aruba.it Racing – Ducati) placed seventh, and no less a figure than four-times champion Jonathan Rea (Kawasaki Racing Team) eighth. Privateer Kawasaki riders, Jordi Torres (Team Pedercini Racing Kawasaki) and Toprak Razgatlioglu (Turkish Puccetti Racing) rounded out the top ten, with Razgatlioglu also a giant crasher just before the red flagged finish. Krummenacher took the top spot for WorldSSP in Assen. Randy Krummenacher (BARDAHL Evan Bros. WorldSSP Yamaha) won pole position after Superpole in the middleweight class, but like the WorldSBK Superpole session before it, WorldSSP Superpole qualifying was halted early. Sykes pulled off his first fastest time with the new BMW S 1000 RR. 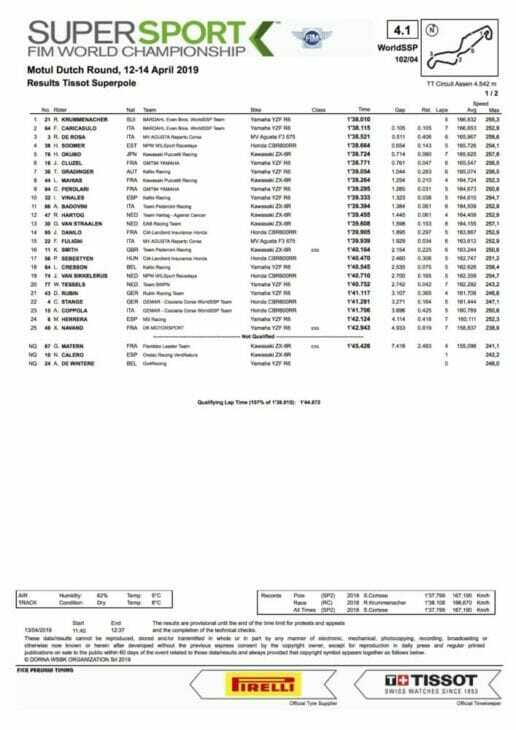 Tom Sykes (BMW Motorrad WorldSBK Team) stole the first day fastest time at Assen with a remarkable late showing of full commitment, going to the lead by just 0.003 seconds. With still a lot of engine performance left to find from the all-new S1000RR, this was an amazing use of the machine’s chassis set-up. All-time Assen race winning rider Jonathan Rea (Kawasaki Racing Team) looked to have posted the fastest time of the two Friday Free Practice sessions at Assen, until Sykes only just beat his long-time best. None of the top times came nowhere near the lap record and a big part of that is because the track temperature only just eventually clambered over 15°C, as Assen was chilled to the bone despite the dry and even sometimes sunny weather. Leon Haslam (Kawasaki Racing Team) made us of his recent BSB experiences at Assen to run out third on day one, just 0.013 seconds from Sykes. 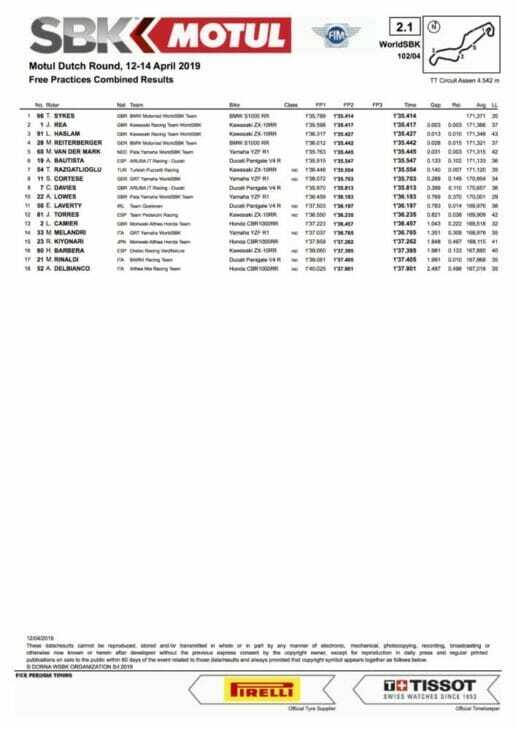 A great opening day for BMW places Markus Reiterberger (BMW Motorrad WorldSBK Team) fourth, with homeboy Michael van der Mark (Pata Yamaha WorldSBK Team) in fifth place. The top five riders were covered by just 0.031 seconds on day one. Sixth, and seemingly unable to get as much drive in cold conditions as his peers, was runaway Championship leader Alvaro Bautista (Aruba.it Racing – Ducati). He was, however, just 0.133 seconds from the fastest. 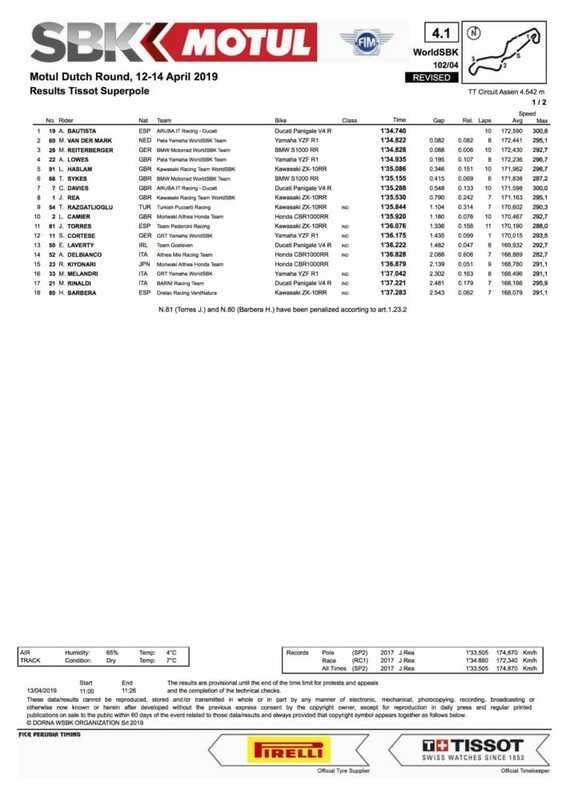 Toprak Razgatlioglu (Turkish Puccetti Racing) was seventh, Aragon top three practice man Sandro Cortese (GRT Yamaha) was eighth, and Chaz Davies (Aruba.it Racing – Ducati) ninth. Alex Lowes (Pata Yamaha WorldSBK Team) fell at a key time and finished tenth. Jordi Torres (Team Pedercini Racing Kawasaki) was 11th and Leon Camier (Moriwaki-Althea Honda Racing Team) 12th. Krummenacher was top of the pops in Supersport on Friday. 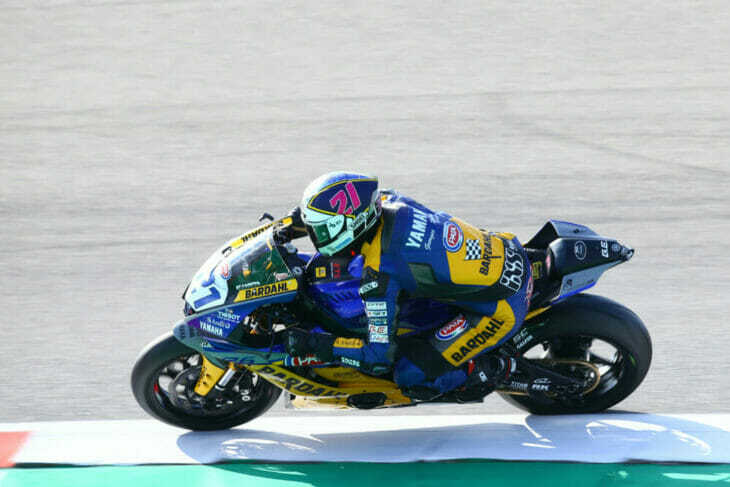 Championship leader Randy Krummenacher (BARDAHL Evan Bros. WorldSSP Yamaha) was the quickest WorldSSP rider in the combined times from day one at an almost petrified Assen. Federico Caricasulo, with the determined Frenchman Lucas Mahias (Kawasaki Puccetti Racing) using all his experience to finish third. Adding in more machinery variety today was Raffaele De Rosa (MV Agusta Reparto Corse) third quickest, as Jules Cluzel (GMT94 Yamaha) placed fifth. The top six was completed by Hikari Okubo (Kawasaki Puccetti Racing), 0.508 seconds behind Krummenacher. Isaac Vinales (Kallio Racing Yamaha) was seventh, and a rider accustomed to being top Honda, Hannes Soomer (MPM WILSport Racedays Honda), was eighth. Aragon front-runner Thomas Gradinger (Kallio Racing Yamaha) was ninth thanks to his morning best time, while the top ten was rounded out by local rider and series regular, Glenn van Straalen (EAB Racing Kawasaki).